So, Meimei, what happened to you was completely unacceptable and I absolutely agree with you that oftentimes we are so worried about being polite and non-offensive to strangers, that we put ourselves at risk. This makes me think about how I really do need to teach both J and Little E how to behave if they are ever placed in a similar situation. At the moment, J and Little E have very little opportunity to be left completely on their own in a public area as they are always in the company of a responsible adult. However, being in company of a grown-up doesn’t always mean that the kids are safe. A few years ago, when J was around 2 years old (before Little E was born), I was in the local library queuing up at the information counter to speak to the librarian. I was carrying some books in my arms, so I let J toddle around my legs whilst we were waiting. A few minutes later, a young man joined the queue behind me and started talking to J. For some reason, I felt very uncomfortable with this man’s behaviour. To be fair, strangers have come up to talk to me and attempt to elicit a smile from J, and I usually do not mind at all. However, unlike most other people who limit their interactions to waving at J and maybe having a little game of ‘peek a boo’, this man ignored me completely and kept trying to get J to shake his hand. Eventually, I just picked J up because it was clear that he was not going to let J alone. He eventually did acknowledge me but when he talked, his eyes were only on J. I was relieved when it was my turn to speak to the librarian because it meant that I wouldn’t have to continue a conversation with this man, who seemed only interested in pressing me for personal information, even asking me where we lived (I answered this question by waving my hand vaguely around). Alarm bells went off in my head when I left the library information counter. As I stepped away from the counter, anxious to get away, the man immediately left the queue (he had been queuing behind me for nearly twenty minutes) and tried to engage us in conversation again. Needless to say, I found this very suspicious so I made some feeble excuse about needing to visit the toilet and quickly bustled off with J in tow. I hid with J in the ladies loo for as long as J would tolerate it, then I decided that it would be better if we just left the library altogether. On the way out, I stopped to read the library noticeboard, as was my usual habit upon leaving the library. To my surprise, there was a small folded note on the noticeboard, exactly at my eye level and it had my full name written on it. I had a cold chill up my spine. Hurriedly, I snatched the note off the board and opened it, to discover a drawing of a family tree (my name, my husband’s name and J’s name on it), with the words ‘Love’ and little hearts hand drawn all around the borders. J’s name in particular was circled several times in different coloured inks. If I didn’t know any better, I would have said that this was a love note written by a schoolgirl. I had another cold chill up my spine. I have no doubt that this was written by the very same man who had approached us earlier. He would have had the opportunity to listen in as I gave my full name to the librarian, and I had stupidly told him both my husband’s and J’s names. However, the only way he would have known where to place the note so that I would definitely see it, would be if he had observed our behaviour in the library before. This was a library that we visited very often, usually at the same time each week. I was so shocked that I just ripped up the note into little tiny pieces and immediately shoved it into the dustbin, then quickly exited the library, checking to make sure that we were not being followed or watched. When I got home, I felt very conflicted because I was not yet sure if I was overreacting and being an overprotective or oversensitive parent. I mean, who knows what his intentions were? Avoid the library for a few months and visit a different branch instead. Contact the library to let them know of this incident so that they could keep an eye out for this man or at least be more wary of people who happen to loiter around the children’s section for no particular reason. The library was able to identify the man via cctv footage based on the information that I gave them (they had evidence that he spent some time writing something on a table near the library noticeboard before pinning it to the board). The library staff reassured me that they would ensure that he would not be allowed to enter the children’s lending section or approach any unattended children in the library. I still do feel that I placed J at unnecessary risk by interacting with this guy. In retrospect, I think I should have listened to my instincts and just abruptly cut this man off instead of politely responding to his questions and allowing him to interact with J. It was 9 PM. Trapeze class had just ended and I was waiting for the bus home. It was dark. To make the wait shorter, I was on the phone to Boobook. He walked up to me and stood there, waiting. A fellow bus passenger, I guessed. I was still chatting with Boobook when he started talking. At first I wasn’t sure who he was talking to, but then I realised that he was talking to me. He was a complete stranger. I didn’t know him at all, but I was polite. I’m the friendly sort and I like making friends with new people, even people I don’t even know. Still, something about his demeanor was off, especially since he had started a conversation with me when I was clearly on the phone with someone. I told Boobook to hold on for a second while I addressed the stranger. He asked me where I was going and which bus I was waiting for. He said it was dangerous for a woman to be at the bus stop at night alone. I said I didn’t mind as the buses were fairly regular and I didn’t have to wait very long. Then, he offered me a ride home. He didn’t ask where I lived, he merely said that he would drive me home. He dangled his keys in my face and shook them, disorienting me so that I could not get a good look at his face. I remember the keys. They were on a Mazda keyring. I remember the folder he was carrying, it was plastic. Blue with green stripes. I remember his strange bobcut, which framed his face. I cannot remember his face. I was too distracted by the keyring and the folder. I realised at that point that he wasn’t a fellow bus passenger, but a very creepy person. I was certain that he did not have my best interests at heart even though he remained polite and friendly. I told him that I was fine, that I would make it home on my own and that the bus would come soon. He continued to jangle the keys in my face and repeat his offer, now more agitated. I stood up, put the phone to my ear and began walking towards the nearby pub. He followed me. For two blocks until I saw the bus. I ran alongside the bus and waved at them, frantic. If it did not stop, I would run to the pub and stay there. The bus driver wasn’t going very fast. He saw my distress and stopped for me. Boobook was afraid too, ready to call the police should I scream, or stop talking. He did not stop talking to me until my heart had stopped beating so fast. When I called the police the next morning, they asked me all sorts of questions about the man, but I couldn’t remember his face. I couldn’t remember the clothes he was wearing or anything pertinent. All I could tell them was the name of the pub, the area where the bus stop was and the man’s hair and keyring. Everything else was a blur. The police said that they couldn’t do anything about it unless a few more women complained about the same person. I told this to a friend of mine, and she related a story in which the details were similar. A man had approached her and offered her a lift home in his car. She told him that she was fine but he kept following her, getting more and more insistent that she come with him, almost to the point of violence. Eventually, she managed to run all the way home and lock the doors. He stayed outside her house for a while, then went away. The first body appeared a week after. The next body appeared a week after that. By the time she’d figured out that the man she saw that day had been killing these girls, it was too late. She couldn’t remember a thing about him anymore. He managed to kill another few women before he was caught. Looking back on the situation, I realised I shouldn’t have been so polite to the man. I should have been rude. I should have made a scene. Thing is, weird creepy strangers who approach lone women often take advantage of societies expectations and social niceties to catch people off guard and to make women (and men) agree to do things that they wouldn’t normally agree to do. For example, Jill Meagher was taken while walking home by herself and the only footage they could find was of her speaking politely to a man in a blue hoodie. That blue hooded man raped and killed her, burying her in a shallow grave. If a creepy guy approaches you anywhere and is all weird about it, give yourself permission to be rude and ignore him. If he persists, give yourself permission to make a fuss, shout, scream, yell or bellow “GO AWAY!”, when he approaches you. Get yourself to safety, whether it be at a brightly lit train station, a pub or even simply into the nearest shop. Tell people that you’re being followed by this person. It’s better to be wrong about people than to be dead. And please, please report it to the police. Not the day after, but immediately after the incident, while his face is still fresh in your mind. You might stop someone else from getting hurt later. The New South Wales police do not take kindly to stalkers or creepy guys harrassing women in general. The police assistance hotline is 131 444, but the police also have a good resource about protecting yourself from stalkers on their webpage here. Singapore also has an anti harrassment bill that makes stalking a criminal offence. You can also contact the police at their hotline on 1800 225 0000 or contact the nearest neighbourhood police centre. The author of this book apparently grew up in a pretty abusive household, so while most of his advice is sound, some of his personal experiences trickle through. This is most notable in the parts where he sort of says that “It’s your fault if you stay.”. We at Owls Well do not believe that it’s the victim’s fault that they’re in a terrible situation and do not condone this way of thinking. So the school holidays have arrived and there’s now plenty of time for the Owlets to be out and about! It’s all about sunlight and fresh air! With all the outdoor time, we try our best to make sure the Owlets receive adequate sun protection with sunscreen, hats and of course, sunglasses! It’s important to protect the eyes from the effects of UV-radiation, so a good pair of well-fitting sunglasses is absolutely key. Retinal exposure to UV-radiation is associated with cataract formation and macular-degeneration, both leading causes of visual impairment. Since UV-damage builds up over time, the earlier that kids get into the habit of protecting their eyes, the lower their risk will be of developing eye problems in the future. Mummy tip #1: When choosing sunglasses for kiddies, make sure that the lenses are certified to block out 100% of UVA and UVB rays at the very least. 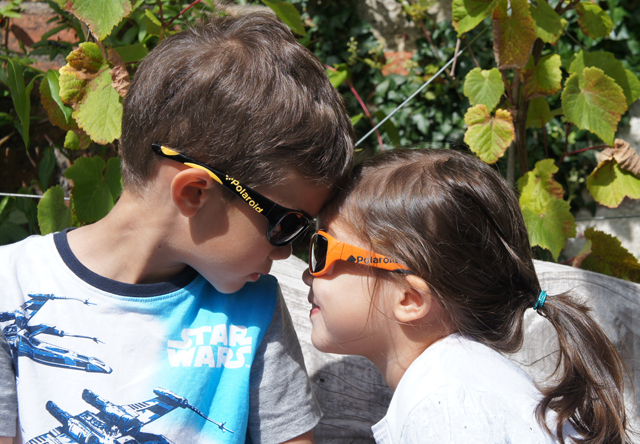 Not long ago, the good people from Safilo were kind enough to give both J and Little E a pair of Polaroid sunglasses, which are now our ‘go-to’ sunglasses whenever we leave the house. The kids were given the opportunity to choose their own sunnies – this took them ages cos there were a ton of styles and colours to choose from. After much deliberation, J went for a very cool pair of black frames with bright yellow accents, and Little E chose a sunny pair of orange frames with black accents. A comfortable and snug fit for little faces! Polaroid Eyewear makes supercool polarised sunglasses which are great for sensitive little eyes as they block out glare and provide 100% UV 400 protection (blocking out UVA, UVB and UVC rays), and the scratch-resistant lenses are made from injected polyamide, so that they are lightweight and impact-resistant, which make them ideal for active little ones who are likely to bang the sunglasses around during playtime. Mummy tip #2: Look for playground-proof lenses that won’t pop out of their frames or shatter! I particularly like the wide, wraparound design which provides all-round coverage as well as the incredible flexibility of the frames which can be bent almost backwards without becoming deformed! This means that the sunglasses hug the face comfortably without leaving marks…and I don’t have to worry about the kids spoiling or breaking their sunnies through rough handling. Hurray! Mummy tip #3: Make sure that the sunglasses cover as much of the eye as possible – try to choose large, wraparound lenses. 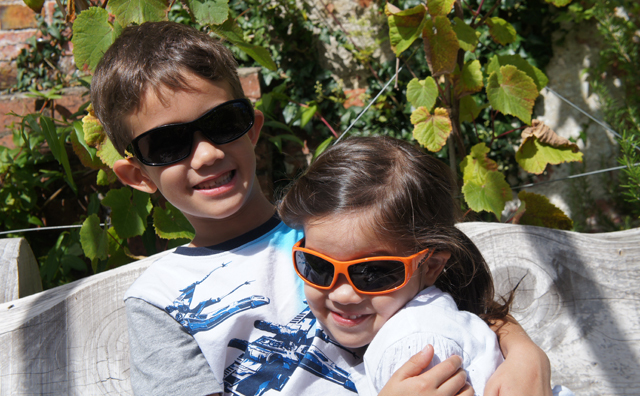 What’s more, the kids look great in them – and they know it – so I don’t get any fuss from them when I remind them to put their sunnies on! 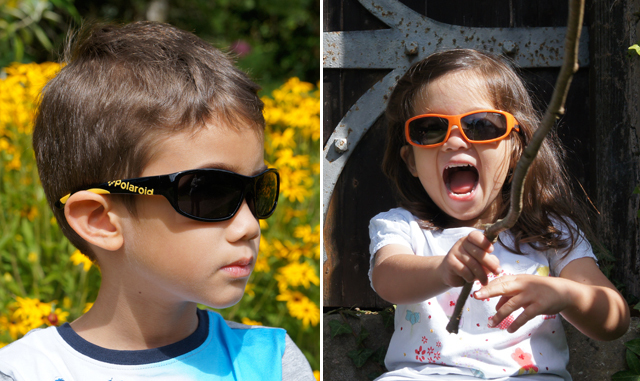 A Special Something for Owls Well Readers: The fine folk at Safilo are kindly sponsoring ONE pair of Polaroid Eyewear kids sunglasses (the same black-and-yellow pair that J is wearing in the pictures above, worth SGD$60) to one lucky Owls Well Reader! Woohoo! Update: This giveaway is now closed and the winner has been contacted via email. Thanks for playing! 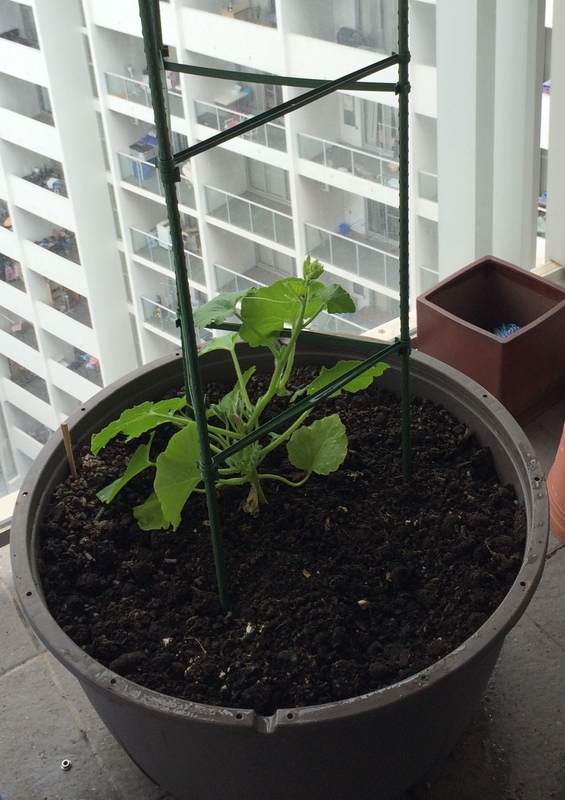 It’s been a while since I last wrote about my garden, so I thought I’d give you all an update! It’s been going more than reasonably well and growing in a manner reminscent of a cartoon or video game. 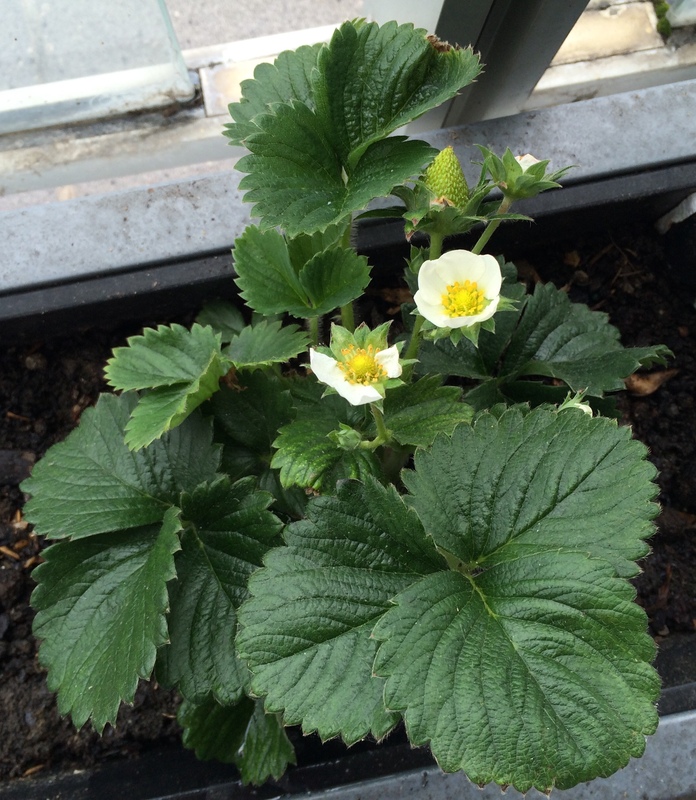 After many weeks of only putting out deep green leaves, the strawberry plant finally started getting serious about the whole making fruit thing and popped into about five flowers. That was this morning. The following photograph was taken at about 5 PM today. Only three of the five flowers remain, the other two have turned into large green fruit. It’s like Minecraft! I can’t wait for the fruit to ripen! Meanwhile, the cheap tumbling compost bin that I purchased finally gave up the ghost. The plastic on the bin wasn’t properly treated for Australian weather and started to degrade under the ultraviolet light. The bolts on it couldn’t handle the stress of being tumbled daily. It started to split two weeks ago and it wouldn’t be long before the whole bin broke and poured compost all over my balcony. Plus, the Herculean effort needed to spin the bin each day was starting to make my back hurt from the strain. At the same time, the pumpkin plant was starting to get root bound from being in the tiny pot I had originally put it in. Pumpkins need a lot of space to grow and plenty of water and sun. Heck, most gardening guides recommend that you just build a huge mound of dirt and let the pumpkin just grow all over it. Since I didn’t have the luxury of building a “huge mound of dirt”, I decided to kill two birds with one stone. First, I bought a brand new compost bin, a fancy UV-protected, glass-reinforced bin with a crank on the side! No more backaches for me! After moving some of the compost from the old bin into the new one, I cut the old compost bin in half and turned it into a mega-pot for the pumpkin! It’s been thriving ever since. There’s a lot of little pumpkin flowers at the base too, and the soil’s very rich, perfect for growing. I’m really looking forward to the fruits of my labour. Boobook has promised me a veggie patch when we move into our new home together. 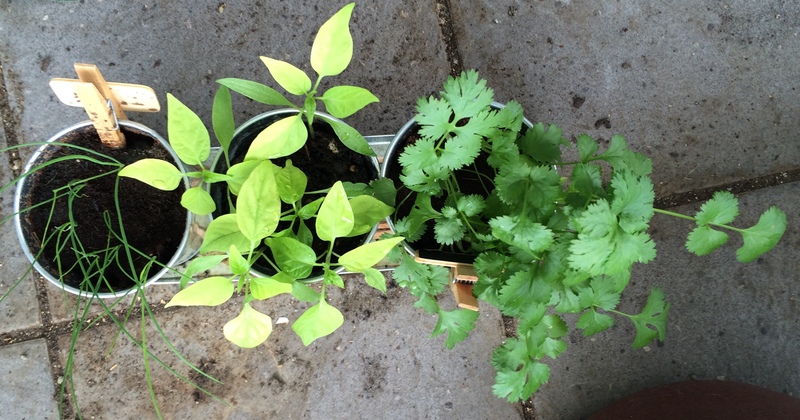 I’m looking forward to being able to plant vegetables without the constraints of pots. There’s nothing like a Baymax Hug! So, a few days ago, the kids and I were invited to the sneak preview of Disney’s latest animated feature film, BIG HERO 6, which is very (very) loosely based on a little-known Marvel comic book of the same name. AND. IT. IS. SO. AWESOME. The movie revolves around 14 year old robotics prodigy Hiro Hamada, and Baymax, an inflatable vinyl healthcare robot created by his college-aged older brother, Tadashi. When disaster strikes the city of San Fransokyo, it’s up to Hiro and his friends to save the day. As you can tell, the main story arc itself is a straightforward superhero origin story complete with Big Scary-yet-tragic Masked Villian, Colour Coded Superhero Team Members and a Musical Training Montage! YEAH! Mummy Warning: The action is brilliant, fun and well-paced, although some parts may be a little bit intense for preschoolers, particularly if your preschooler is sensitive. My own 3 year old Little E did need a little reassuring cuddle during the battle scenes, but there’s nothing gory or gruesome to worry about. If you are concerned about how your child is going to react, try showing your kids the trailer first! In terms of animation, the look of the film is a beautifully rendered mash-up of East-West culture, with the story taking place in the city of San Fransokyo, which looks absolutely gorgeous from its rolling Californian hills (so great for car chases!) to the Golden (Torii) Gate Bridge. The attention to detail is absolutely incredible, and I am not surprised to discover that Disney had to assemble a dedicated supercomputing cluster in order to handle the digital processing demands. I have to say that I am very excited to see some main characters that are not only of Asian descent, but who also look and behave, well, like regular people. Not once during this film did I hear the phrase, “You have dishonour your fambry!”, nor did I see any wispy bearded old person wearing a silk robe and dispensing sage advice. None of that! We are making big steps here, people, big steps! The movie was also a great launching point for many discussions with the owlets on the nature of science and ethics as well as the capacity for people to make helpful or harmful choices. My 6 year old, J, was particularly thoughtful after the film, commenting that creativity can be channelled in both constructive and destructive ways, and it is up to each person to decide how they want their actions to impact the world. We watched the film in Incredible 3-D, which I felt did very little to enhance the overall experience of the film, so here’s a tip: save your pennies and watch Big Hero 6 twice instead! Don’t forget to stay to the end of the credits for the obligatory Marvel-related cameo. Debs G rates Big Hero 6: An exploding fist bump followed by an acrobatic fire-breathing dragon! Big Hero 6 premieres today (13 Nov 2014) at cinemas across Singapore. Go watch it! It’s been a while since I last had to do a reader announcement but as both Debs and I are currently overbusy, we will be taking a short hiatus on the blog, then moving to a new Tuesday-Thursday posting schedule. In the meantime, however, Debs is super busy with the kids and school and I have currently retreated into the study caves where nothing is done except the study of statistics and the eating of food. Owls Well should return shortly, but you should feel free to check out the many lovely links that we have on the sidebar for you to enjoy!